For the first time since MAST Europe in Genoa, Italy in 2007, visitors to next year’s event can discuss their missile/systems requirements with executives from MBDA, the only European group capable of designing and producing missiles/missile systems that correspond to the full range of current and future operational needs of land, sea, and air forces. 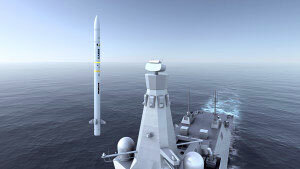 MBDA has just been awarded a £100M Demonstration and Manufacture contract by the UK Ministry of Defence (MOD) for the Sea Ceptor air defence system (pictured) for the UK Royal Navy’s (RN) new Type 26 class frigate, Global Combat Ship (GCS), providing the principal air defence of the T26 and nearby ships against advanced airborne threats including sea-skimming anti-ship missiles, fast jets, helicopters, and UAVS. Earlier this year MBDA was awarded a £184M production contract for the supply of the ASRAAM (highly capable infra-red (IR) guided air-to-air missile) to equip the UK’s F-35 Lightning II stealth fighter jet (produced by MAST Asia Platinum sponsor, Lockheed Martin).